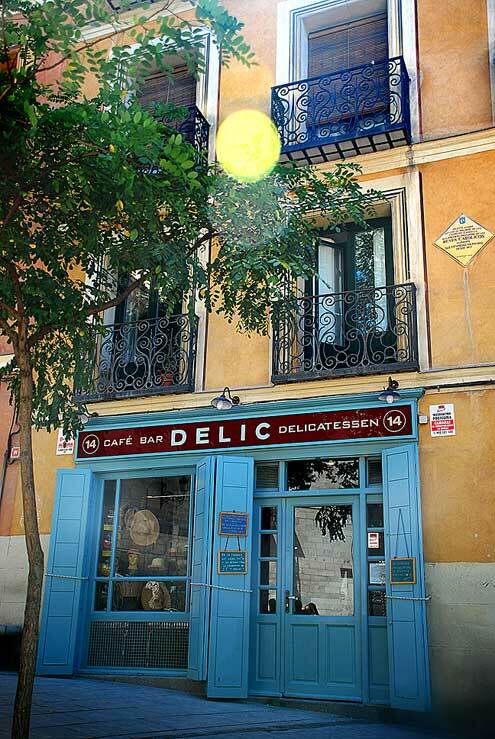 Was it only a week ago that the yumbloggers were sitting in 35ºC of Madrid heat on the terraza outside the Café Delic eating lunch and drinking chilled glasses of refreshing Mahou Classic? (Stop it, you’re beginning to sound like a middle class wanker – Ed) Ah yes, Blogger-D had a simple roll generously filled with delicate whispers of the finest Jamón Ibérico de Bellota, and Blogger-Me had an intriguing and amusing post-modern variation on Salade Niçoise. Perhaps it was the relaxed setting, the heat of the midday Iberian sun or the icy-cold lager, but that salad was one of the most delicious lunches I had had in a long time. I vowed to recreate it once I got back to grey damp shop-soiled old Blighty… and this was the result. 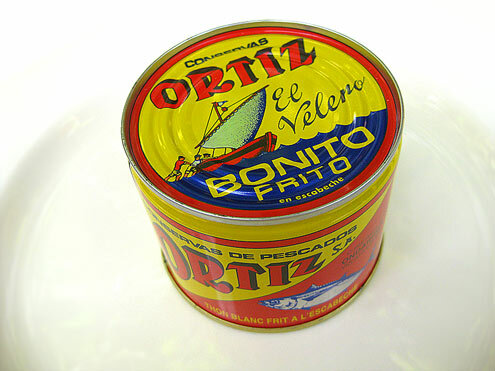 Why not splash out and spend three and a half euros on a fancy tin of tuna? 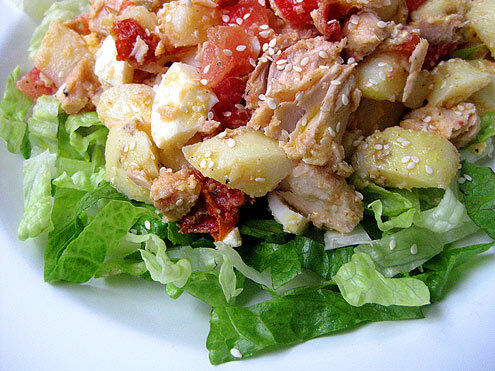 Put the potatoes, tuna, egg, tomatoes and peppers into a large bowl and mix together with your hands. Season. Make a generous amount of dressing by mixing together the olive oil and vinegar in a ratio of 4:1. Pour over the salad, add some sesame seeds and mix together. Check the seasoning. 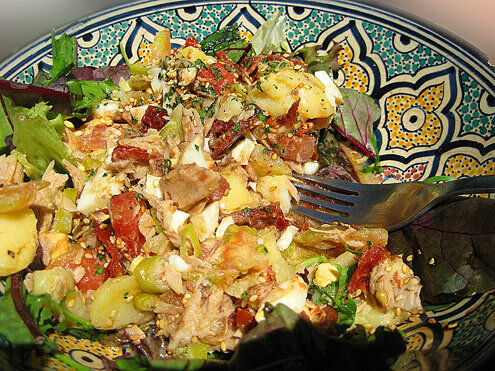 The salad will benefit from sitting for a short while so that all the flavours can meld together. To serve, line the dishes with the lettuce leaves and spoon over the salad. Drizzle with a little more peppery olive oil. Order another beer and enjoy. Verdict: This was almost as tasty as the one I had on holiday despite it being a damp evening in Bethnal Green. Remember to be generous with the sun dried tomatoes, Jalapeño peppers and olive oil as these all combine to give this salad its zingy kick. Drink: A bottle of Rosé from the disappointing wine section at the local Co-Op. Entertainment: ‘New Tricks’ on iPlayer. A not very guilty pleasure here at Yumblog Towers. Who could resist singing along to the theme tune?